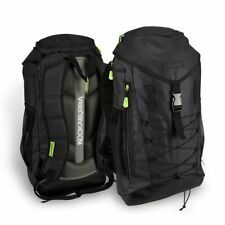 Osaka Hockey SP large Back Pack Navy/Green New With Tags RRP £60. Condition is New. Dispatched with Royal Mail 2nd Class. RRP new is upwards of £ 50. The exact bag is shown in the main photo although not a photo of the actual bag for sale. - outer side and bottom pouches. Adidas Hockey Bag Blue Main Stick Compartment 2 Frontal Compartments (Mouth Guard Large Storage Compartments) Condition is Brand New. RRP - £30 Fits any size stick. Single stick hockey bag with shoulder strap, bottle holder and small front pocket. Slazenger Hockey Bag. Condition is Used. Dispatched with Royal Mail 2nd Class. A good sized coaching tactics board from Kookaburra with a unique coloured pitch. Rest of the World £14.95. Austria, Germany, Netherlands, Belguim, Greece, Poland, Bulgaria, Hungary, Portugal, Cyprus, Ireland, romania, Czech republic, Italy, Slovakia, Denmark, Latvia, Slovenia, Estonia, Lithuania, Spain, Finland, Luxxemburg, Sweden, France and Malta. Fleece lined valuables pocket. Rain cover top to ensure all kit remains dry. Durable waterproof anti scuff guard base. Holds up to 6 sticks. Adjustable twin padded shoulder strap and padded back supports. Grays GR 800 Hockey Kit Bag - Black/Orange. Dual Padded strap design for comfort. • Securing clip so bag can be hung in the wet. 2017-18 Team Kit Bag. Capacity - Up to 6 Sticks plus Kit. Canopy style opening top pocket. Multiple sections for kit and shoes. Incorporated "pick up" handles. Duffle bag ideal for carrying hockey or cricket balls with an adjustable strap. Pull cord closure. Holds approx 36 ballls. Rest of the World £14.95. Austria, Germany, Netherlands, Belguim, Greece, Poland, Bulgaria, Hungary, Portugal, Cyprus, Ireland, romania, Czech republic, Italy, Slovakia, Denmark, Latvia, Slovenia, Estonia, Lithuania, Spain, Finland, Luxxemburg, Sweden, France and Malta. CAPACITY - Up to x4 sticks plus kit. Incorporated “pick up” handles and highly durable base. New for 2018. Product Description This hockey stick bag worth £56, features a zipped stick compartment, multiple additional compartments for kit and shoes, a padded single shoulder strap and external mesh pockets. The M.A field hockey bag is finished with branded zip pulls, Superdry Hockey logo prints and a Superdry Hockey logo patch above the shoulder strap. Unique coloured pitch. Good sized coaching tactics board. Grays GX3000 Hockey Bag. Worn/Used Condition - Fully Useable - Plenty Of Life. Grays GX3000 Hockey Bag. Worn/Used Condition - Fully Useable - Plenty Of Life. You can see from the photos that there is clear signs of use and wear but still in useable order. The bag takes at least 2 Hockey sticks plus kit.